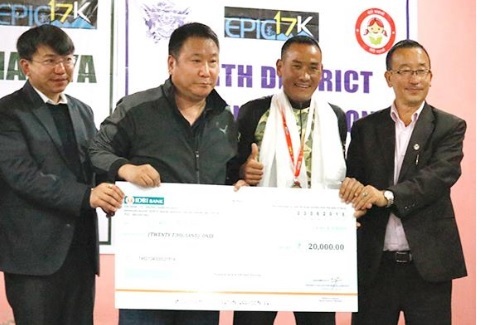 Isaak Rai emerged as the overall winner of the four-stage EPIC 17K mountain terrain biking event in North Sikkim covering a distance of 330 kilometres in 13 hours, 32 minutes and five seconds over a span of four days. Rai, a Sahastra Seema Bal (SSB) cadet based in Utrarakhand with two years of experience in mountain biking, also won the coveted ‘King of the Mountain’ title. The SSB cadet hailing from Kalimpong finished the first stage from Mangan to Lachung with timing of two hours, 35 minutes and 30 seconds and second stage from Lachung to Yumesamdong, also a distance of 53 km, in three hours 39 minutes and 37 seconds. For the ‘King of the Mountain’ title which carries an additional Rs. 20,000 prize, he won the third stage of the race covering a distance of 83 km from Lachung to Thangu, crossing the longer Lachen Axis in four hours, 47 minutes and 56 seconds on June 28. In the final leg of the race on Friday, Rai finished as the joint winner alongside West Sikkim’s Asim Sharma covering the 32-km stretch between Thangu to Gurudongmar Lake, cycling at an altitude of 13,000 feet to 17, 800 feet, clocking a time of 2 hours, 29 minutes and 2 seconds. Rai walked home with a prize money of Rs 70,000 as the winner of the overall race as well as with Rs 20,000 for winning the King of the Mountain title. In the masters category featuring riders above the age of 40 years, 62-year-old Tashi Dorjee Tangbi stood first with timings of 17 hours, three minutes and 28 seconds. The event organized on the theme of ‘Beti Bachao, Beti Padhao’ initiative also featured four female riders, namely, Binita Rai, Binodeni from SSB, and Wendy Lepcha and Sonam P Lachungpa from Sikkim. The other theme of the race was ‘Secure Himalaya’ for the conservation of locally and globally significant biodiversity and forest resource of Himalayan ecosystem.